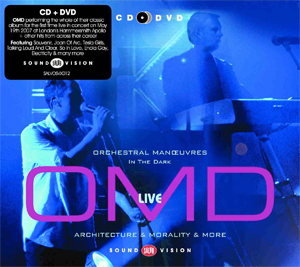 The OMD Live: Architecture & Morality & More CD and DVD are due for reissue as a combined package later this year. Following OMD’s successful 2007 tour, in which they played the Architecture & Morality album in its entirety, one of the concerts was captured for posterity as both a live album and also a live DVD. Titled OMD Live: Architecture & Morality & More, it was recorded at Hammersmith Apollo, London on Saturday 19th May 2007. Originally, the CD and DVD were released separately in 2008 and this special box set will see both released together as a special package. OMD Live: Architecture & Morality & More is due for release via the Salvo Sound & Vision label on 8th April 2013.